There are 2 ferry routes operating between Denmark and Sweden offering you combined total of 63 sailings per week. Stena Line operates 2 routes, Frederikshavn to Gothenburg runs 7 times per day & Grenaa to Varberg about 14 times weekly. As the frequency and duration of crossings on some routes varies we would advise that you do a live search for crossings from Denmark to Sweden to get the most up to date information. 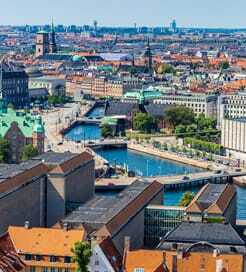 Denmark is the southernmost country in Scandinavia, boasting some of the highest rated standards of living in the world. Often regarded as a ‘fairytale country’, Denmark has both natural and architectural splendour in abundance. Renaissance castles stand on lake banks and stunning sandy beaches line the coast. Whatever the season, Denmark has something to suit. However, it is much more than just beautiful buildings and scenery. Its capital, Copenhagen is a hub for fashion, gastronomy and forward-thinking design. It’s also a haven for cyclists, with a vast network of cobbled streets leading you to candlelit bars and fascinating museums. Denmark is an excellent gateway to the surrounding Scandinavian countries and mainland Europe, with a large number of top-quality ports providing numerous routes, all operated by leading ferry companies. Also, as a nation with many islands and peninsulas, travelling by ferry is the most convenient way to explore everything Denmark has to offer. Sweden is a Scandinavian country in Northern Europe, sharing a lengthy western border with Norway and a shorter north-eastern border with Finland. One of the European leaders for quality of life, Sweden is a beautiful nation in all aspects. The diversity of magical landscapes is one of its greatest assets, stretching from the sparse and snow-filled north, inhabited by the indigenous Sami people, to the lake-speckled central region and the high-energy, fashion-inspired capital city of Stockholm in the south. A long Viking history has left its mark; ancient rune stones and huge burial mounds can be found throughout the country, all with their own fascinating story to tell, while the medieval cities and coastal castles add a further layer of mystery. 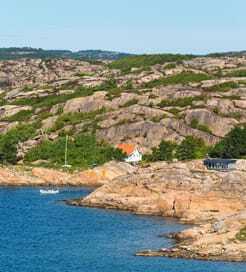 Sailing to Sweden by ferry is a common choice for visitors, thanks to the huge number of routes from various countries in northern Europe and Scandinavia, all operated by a wide choice of excellent ferry companies.